MANCHESTER — On at least two occasions, Roman Abramovich tried and failed to persuade Pep Guardiola to jump onto Chelsea’s managerial carousel, so the club’s Russian billionaire owner will not have enjoyed seeing the Catalan mastermind Manchester City’s 6-0 hammering of Maurizio Sarri’s team at the Etihad Stadium on Sunday. Sarri has lost eight of 40 games in charge and the current Chelsea squad do not seem to be listening to him either, so Abramovich is the only person who can truly say how long he has at the helm. Sarri’s purist form of football, with goals, pace and ambition, worked well at Napoli — even though he did not win a trophy — but has not translated itself to English football. He was appointed to make Chelsea as easy on the eye as Guardiola’s City and it remains to be seen whether he will, but Sarri at least has support from his opposite number in Sunday. Guardiola’s last line, about the importance of being backed by his bosses, is perhaps why he never accepted Abramovich’s offer to manage Chelsea, given the shelf life at Stamford Bridge is notoriously short. 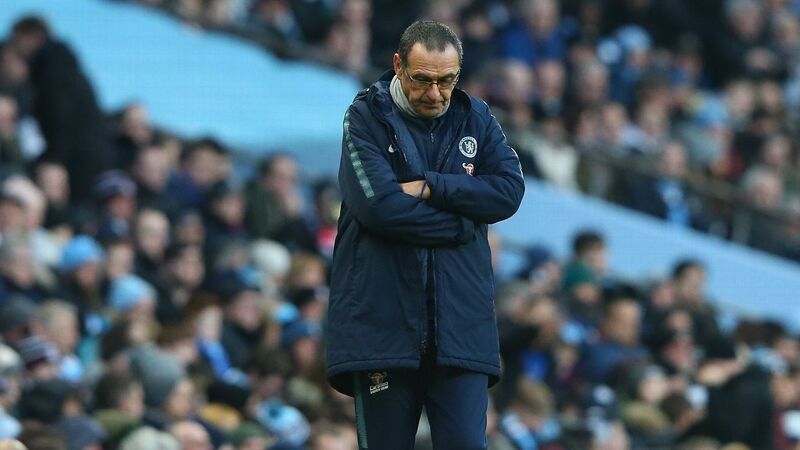 However, Sarri is doing little to help himself by insisting he will not change or bend the philosophy that is so clearly not working; “Sarri-ball” was more like Sorry-ball at City. Guardiola’s style is so ingrained that the Premier League champions were like a machine, with their incisive football cutting the visitors apart. True, he has had time and over half a billion pounds to make City so strong, whereas Sarri is six months into his role and inherited a squad barely suited to his demands, but coaches must be flexible and pragmatic and the Chelsea boss displays neither of those qualities. “Today, I didn’t see my football,” he said after the humiliating defeat. “At the beginning, it worked, so now, we need only to understand the reason why, at the moment, it isn’t working. We need to understand and the reason is not easy. Given the fortunes of his predecessors, the odds are against Sarri being given time to see his vision of utopia at Chelsea, though he does have the chance to avenge this defeat against City in the Carabao Cup final in two weeks’ time (Feb. 24, 11:30 a.m. ET; ESPN+). Winning that trophy alone will not be enough to keep him in a job, however; Abramovich demands Champions League football and Sarri is increasingly in danger of failing to deliver a top-four finish. Chelsea are sixth, behind Arsenal on goal difference and one point adrift of fourth-placed Manchester United. Sunday proved to be a good day for both Manchester clubs, then, but City were not out to do United any favours. Instead, the day was about reclaiming top spot from Liverpool and they did so in comprehensive fashion. Sergio Aguero‘s second hat trick in a week stole the show, with Raheem Sterling (two) and Ilkay Gundogan completing the scoring. It was a performance to send a chill down the spine of anyone with a Liverpool connection and one that emphasised why City are favourites to win this season’s title race. Jurgen Klopp’s side must respond in their next league game, which happens to be against United at Old Trafford in two weeks. It does not get much more difficult than that, although the Chelsea players and Sarri who face City at Wembley on the same day might beg to differ.